On April 7, we posted about a shamefully propagandistic ‘analysis’ on the Israeli-Palestinian peace talks by their previous Associate Editor, David Gardner. The [pre-Oslo] prisoners in question were supposed to have been released 20 years ago as part of the Oslo accords, at the high water mark for hopes that these two peoples could close a deal on sharing the Holy Land. They were not. As we noted, this is flatly untrue. The pre-Oslo prisoners – scheduled for release under terms agreed upon last year to restart (and continue) negotiations – are all convicted of murder, attempted murder or being an accessory to murder, and there was no provision in the Oslo Accords requiring their release. Israel (per Annex VII of the agreement) agreed to release women, administrative detainees and minors, as well as elderly and sick prisoners, but stated quite clearly that they would not release “prisoners who killed Israeli citizens or were deemed likely to become involved in future acts of violence”, or otherwise had “blood on their hands”. Additionally, “only members of organizations that had stopped supporting terrorism” would be considered for this amnesty. Later, in a series of emails with editors at the Financial Times, they claimed that it was the Oslo 2 Accords that Gardner was referring to, and not Oslo 1. However, as we noted in a subsequent email to editors, Oslo 2 (Article XVI, Confidence Building Measures) mentioned prisoners, but referred back to the language of the text in the original Oslo 1 Agreement, which (again) didn’t require Israel to release violent terrorists. However, the change is completely inadequate. The only change is that they added the modifier “some” to the original claim that “the prisoners in question were supposed to have been released…”. However, as the language of the Oslo Accords cited above clearly indicates, NO violent terrorists (such as the pre-Oslo prisoners in question) were required to be released under the terms of either Oslo Agreement. The Financial Times still has it wrong. The Financial Times getting it wrong in microcosm. The UK getting it wrong in macrocosm. The Financial times is trying to buy CiF Watch off as cheaply as possible. Strange that they would mention the reason for Pollard’s imprisonment, already so very well-known, yet not mention that their beloved prisoners, so deserving of freedom in their opinion, are in prison for a capital crime. It’s as if they’re trying to hide something from the public. 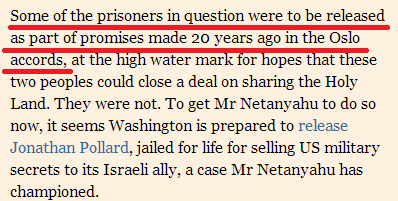 Disgraceful behaviour from the FT. Are they in the Arabs pocket?